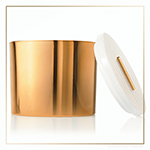 Thymes Frasier Fir Gilded Collection Gold 3-Wick Ceramic Candle is an elegant reinvention of a timeless classic and the perfect fragrance to welcome the holidays into your home. Thymes Frasier Fir bring to life the quintessential aromatic snap of Siberian Fir needles, heartening cedarwood and earthy sandalwood, to stun in the most elegant way. This statement piece stuns during this special time of the year. Accented with a wintery white, elegant wood grain ceramic lid with a touch of gold, it’s the perfect way to experience the just-cut forest fragrance in a new way.